We use only fair trade organic teas (since we can't grow tea in Tennessee) and premium Herbs, Florals, Fruits and Spices to embellish the teas. The list is unlimited on our Loose leaf teas. Custom blends are available. Our main supplier of Tea is Metropolitan Tea, they are extremely conciencious of how their tea is prepared and so are we. Here is some information about Metro Tea. Our base tea comes from Metropolitan Tea, which is extremely conscientious of how their tea is prepared. Here is a little information about Metro Tea. Many corporations perceive environmental and sustainability practices as costly and indulging to social ideals over profit. These practices are in fact, business friendly because they enhance cost savings, generate revenue, meet sustainability policies required by global accounts, provide a positive marketing message and improve goodwill. Carbon avoidance is different than carbon offset. Although both are aimed at reducing the impact of greenhouse gases (GHGs), the latter assumes that pollutants have already been emitted while avoidance means the traditional impact from these pollutants never occurred in the first place. Carbon reduction is reducing the amount of carbon that you are creating by finding greater efficiencies. Metropolitan's main factory in Toronto, Canada has implemented numerous modifications to its plant and equipment over the last 10 years. As a result, we have accomplished a 66% reduction in utility usage (per work unit) while tripling our output over the same period. Future projects are in the planning stages that will reduce utility usage a further 12% (per work unit). Fans move air where required/Ultra efficient lighting. Convert waste cardboard to packing material. Metropolitan realized that by making their vacuum packs square they would fit better into our shipping cartons. Packing equipment was redesigned to make this a reality and now relative to others, we have improved our logistics efficiency be nearly 15%. Similar efficiencies were found by reusing carton boxes. Responding to the UN's Billion Tree and Ontario's 50 Million Tree Programs, abandoned farmland was purchased and 15,000 trees were planted using 7 species to promote biodiversity. Not only did Metropolitan Tea became carbon neutral in 2011 with this action but it was able to create habitat for species at risk. The land also has 80 acres of wetland inhabited by beaver, spotted turtles (endangered), the black tern (endangered) and a whole host of other birds and amphibians. There is a substantial environmental benefit derived from producing renewable energy, primarily the avoidance of greenhouse gas emissions into the environment. There are three major pollutants that are avoided during the production of renewable solar energy and every time our photovoltaic panels are harvesting the sun's energy it means that a traditional electricity production plant (gas or coal fired) gets to reduce its contribution to the grid as well as its production of GHGs such as Carbon Dioxide (CO2), Sulphur Dioxide (SO2) and Nitrogen Oxides (NOx). The fully commissioned 500 Kwh array generates more than 5 times the amount of electricity that the factory consumes. In 2013, despite being located in a northern temperate climate, Metropolitan Tea's solar array generated nearly 1 million Kwh or 1,000 Mwh per annum. By producing this electricity with solar power, we avoided emissions totalling 1,160,000 pounds of CO2; 4,000 pounds of SO2 and 1,600 pounds of NOx. 2600 panels harnessing the sun. Metropolitan Tea was presented with the 2012 Sustainability Award given by the Toronto Board of Trade. Our Environment Action Plan allowed us to achieve this recognition while becoming one of the first global carbon negative tea blending and packing companies. Our corporate partners also have robust programs reflecting our ethos. Since opening our doors, Metropolitan Tea has always supported Fair Treatment and Trading Fairly. We continue to do so and require this ethos of all growers who wish to do business with us. We travel regularly to visit the tea estates – not only to develop relationships but also to ensure that there is fair treatment of the labor force and respect for the environment. WHAT DOES FAIR TREATMENT AND TRADING FAIRLY LOOK LIKE? There is education policy for the children of the workers – again, this often includes an on-site school for the children. Reinvestment in upgrades and proper maintenance to ensure the long term future for all stakeholders. General respect by management of the labor force. When Fair Trade Organization came into the tea industry, we saw that they echoed our ethos (The difference? We did not feel the need to monetize our brand and ethos – it's simply the way we work). Since most tea estates are still beyond the scope of the Fair Trade Organization, we encourage estates to join ETP and we follow our Fair Treatment policies. Luxury teas are produced by a healthy and fairly compensated workforce – one with a vested economic and social interest in their product. In many cases this includes free schooling and Medicare for children and family in addition to fair prices for fresh leaf. Doing business with only the top 10% of the world's estates and making annual visits to our suppliers ensures this is always the case. Since 1978 we've seen much advancement in the way tea is produced, marketed and distributed. The Ethical Tea Partnership is one of the more positive developments we've seen over the years. Metropolitan Tea was the first non-UK firm to join when the ETP opened membership to North American companies in 2003. The goal of the organization is to provide consumers with a complete understanding of where tea is grown and manufactured. Everything from fair compensation to health coverage, housing and childcare comes under close scrutiny. It is similar to the Fair Trade organization, but has a much broader scope for tea consumers since its focus is on tea only. Because tea is not a publicly traded commodity like coffee, Fair Trade is unable to penetrate many of the nuances and regional peculiarities of the tea trade. Where the ETP also differs from Fair Trade is its primary focus. Fair Trade's focus is mainly on economics. The ETP is a socially and environmentally directed organization. This can be helpful since an economically based model, where higher prices are paid in the developing world, can leave the door open for unscrupulous companies to bolster lost margins elsewhere along the supply chain. Purchasing ETP certified teas is the best way to ensure that your teas were produced in an ethical manner. Since the company's inception Natural Habitat Conservation was always been a guiding principal of Metropolitan Tea. We give more attention to tea growers who share our ethos. Practical experience and academic knowledge by some of the company's personnel has shown that good natural habitat improves crop yields because this helps maintain soil nutrients and improves rainfall (by creating a micro climate). In most areas of the world tea is grown 12 months of the year, unlike many other commercial crops. For workers in the developing world, this means a sustainable income is available year round. What's more, the tea bush is a very earthy plant and certain varieties can yield suitable leaf for up to 100 years. This means that the emissions and financial output associated with replanting crops can be greatly minimized. Due to the mountainous terrain and high altitude of the world's leading growing regions, such as Darjeeling, Sri Lanka or Kenya, luxury teas must be hand-plucked. Therefore for most of the world's luxury teas, and virtually all of Metropolitan's products, the harvesting process consumes very little fossil fuel and releases virtually no CO2. One notable anomaly to this trend is Japan, where exceptional green teas are typically harvested by machine. As a rule, tea plantations are net absorbers of CO2, one of the common gasses responsible for global warming. Most estates use renewable timber, unusable wood and root stock from exhausted tea bushes as a fuel source for the tea dryers as often as possible. Not only are these fuel sources renewable and less costly than fossil fuels, they also emit fewer emissions. St. Coombs, Sri Lanka - Wood from estate woodlots fuel its tea driers. On a regular schedule, fields are rotated and left fallow to rehabilitate soil. Chemical input is kept to a minimum to ensure soil beds remain healthy and nutrient-rich. Fuding, China - Pruned tea bush branches are left on the field to enrich and aerate the soil. Wherever possible, Metropolitan Teas are pesticide free. Certain high elevation tea districts, such as Darjeeling, the Kenyan highlands or high grown Ceylons can support tea without pesticides since pests that typically attack tea cannot survive at such high altitudes. Interesting note: We encourage growers to use natural fertilizers (nitrogen, etc.) which promote and maintain crop yield. This in turn requires a significant labor force â€“ a very important function in rural agriculture where good jobs are scarce. While organic growing is good and commendable, we have seen yields drop by 40-50% with commensurate labor reductions. This is not a positive consequence in very rural situations where there are no other job opportunities. This is why "Pesticide Free" is THE EXCELLENT ALTERNATIVE, over organically grown. Ambootia, India - no pesticide use promotes rich biodiversity. In cases where pesticides are used, Metropolitan Tea takes great care to ensure all growers meet (as a minimum) the European Union or Japanese Minimum Residue Levels, the most stringent in the industry. George Williamson Kenya (GWK) is the world's largest and best PESTICIDE FREE tea grower. What does Pesticide Free mean? : It means that absolutely no pesticides are used anywhere on the estate(s) but natural Nitrogen (N) fertilizer is used, (N - chemical symbol for Nitrogen). Pesticide Free and natural fertilizer is a policy on all GWK tea estates. The policy allows them to produce the world's cleanest luxury quality tea and employ more than 10,000 workers in rural Kenya. It should be noted that GWK provides estate housing, schooling etc. and that the 10,000 jobs represent more than 40,000 people who call one of GWK's estates home. In rural Kenya where job prospects with top quality employers are poor, GWK stands as a beacon; environmentally, socially and from a food safety aspect. Certainly tea bags have their place, but our commitment to quality and sustainability means offering environmentally responsible options for consumers is paramount. Our pyramid tea bags are made from Soilon which is a biodegradable material made from cornstarch and not nylon. Child labour is a fact in many of the world's developing countries. Metropolitan tea takes strict care to ensure our teas come from estates and companies that do not employ children at any stage of the tea production process. We feel very strongly about this and wish other tea companies took the same view. Yearly visits to estates and tea factories help us evaluate our supplier's business practices. Any supplier found in violation of our policy will be dropped from our list of approved suppliers immediately. Tea estates are essentially small villages where workers and their families may live for many generations. In all cases, our approved tea estates provide a high standard of living and education for the children of all workers living on the estates. This standard of excellence is what other estates in the region strive to achieve. Margaret's Hope, Darjeeling - Playground at day care center. At Metropolitan Tea, we are proud of our environmental and sustainable policies. We work hard to help to make the world a better place for ourselves and future generations. We will continue to ensure that we maintain sustainable business practices. Metropolitan Tea encourages you to use loose tea. Not only will you have a greater choice of the world's greatest cups, it is also a great way to lower your environmental footprint. To make 200 teabags requires: 200 staples, 200 lengths of string, 200 paper, nylon or other synthetic sheets. Certain loose leaf teas if steeped in water between 82°C - 87°C (180°F - 190°F) can offer the multiple infusions. i.e. China greens and oolongs produce excellent cups in this manner. It sounds simple but it works! Don't overfill your teapot - only boil what you need. Keeping our loose teas as pure as the day they were plucked means that at every step of our supply chain, all precautions are taken to ensure the safety of our products. TEA IS GOOD FOR YOU. AT METROPOLITAN TEA WE INTEND TO KEEP IT THAT WAY. From the garden to the cup, our many layers of quality control ensure a safe experience every time your customers drink teas. If we aren't 100% confident that we would serve our products to our own families we won’t sell them. Further, if we felt we were not doing everything in our power to ensure the continued safety of our products, we wouldn't sell them either. Quite frankly, some things are more important than profit margins. Metropolitan Tea takes an active role in ensuring that safe agricultural practices are maintained on all estates where our tea is grown. We regularly review current standards of loose tea food safety and tea husbandry, especially with regard to agricultural input residue. Food safety standards generally pertain to the US, Canada and Europe. As a matter of voluntary procedure, Metropolitan Tea adheres to European food safety standards, the world’s most stringent. Metropolitan uses 18/8 grade stainless steel exclusively in all metal products – infusers, strainers, teapots, etc. 18/8 grade is a food grade stainless steel approved by the USFDA (United States food and Drug Administration), EU (European Union) and the CFIA (Canadian Food Inspection Agency). Unlike many lower grade stainless products, typically, but not limited to those found in dollar stores, 18/8 grade will not corrode when exposed to the Tannins found in loose tea. Corroded infusers or strainers may allow steel’s harmful properties to contaminate your tea. Our 100% natural flavorings are made from extracted oils. 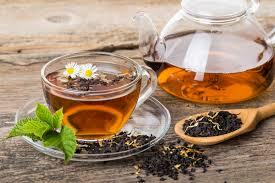 Chemical processes are never used in our teas. Apart from being better for you, natural oils impart a superior flavor with no chemical aftertaste. We pack our tea bags in 100% recyclable paper tea bags. Other companies may carry pyramid tea bags made from plasticized mesh. Though they may have a pleasing aesthetic, recent research suggests that when heated, i.e. subjecting it to boiled water, plastic can release harmful toxins. As such, we recommend avoiding plastic mesh teabags. Plastic tea bags also pose a hazard to the enviroment. All of our teas and herbal teas are packed in special Flavor-Sealed bags to preserve garden freshness, protect flavor and guard against contaminants. Learn how our company and experience can help you take advantage of the world of specialty teas.